Retail inflation cooled in July on the back of easing food and vegetable prices, prompting economists to say that the RBI may hold interest rates when it reviews the monetary policy in October. Inflation, as measured by the Consumer Price Index, rose an annual 4.2%, slower than the previous month’s 4.9%. Rural inflation was at 4.1% in July while urban inflation was at 4.3%. 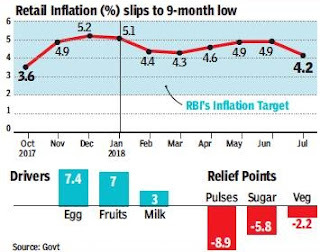 The sharp uptick in retail and wholesale price inflation in the past few months had raised concerns over sticky price pressures. The RBI had raised interest rates twice to calm inflationary pressures and had flagged inflation as a concern. A household survey of inflationary expectations had also pointed to some pressure on the prices front. The CPI data showed vegetable prices declined an annual 2.2%, while sugar and confectionary contracted 5.8%. Pressure was visible on housing and fuel segments. Housing rose 8.3% while fuel and light nearly 8% during the month. Economists said they expect the RBI to pause in its rate-raising cycle, given the easing in some pressure points.